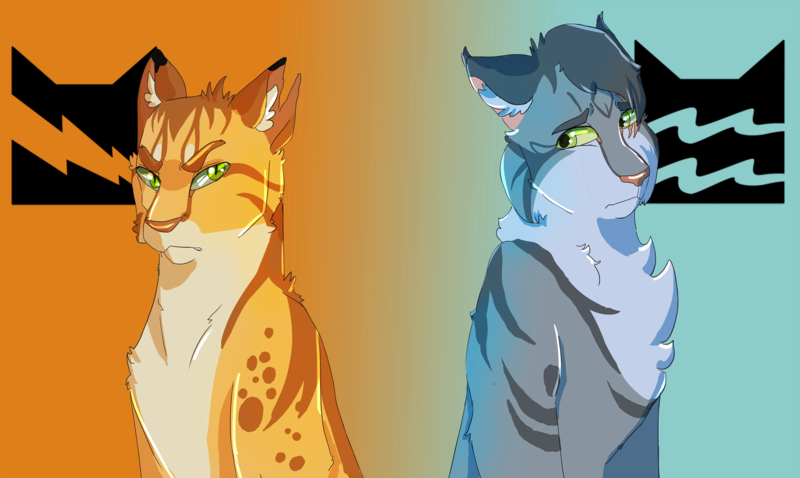 "Farewell SkyClan, I'm glad I chose you." 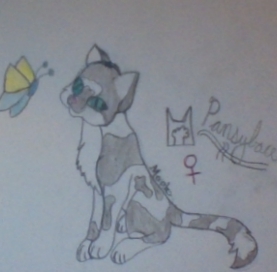 Physical Description: Pansyface was a dark gray and white patched she-cat with a solid white chest and paws. She was of medium height and had a lithe, slender body packed with hidden muscle built from running and climbing trees. She had a dark gray patch on her face that was reminiscent of a pansy flower's pattern, which may have been the clue behind her name. Her eyes were a bold, pretty murky green color, which she prized as her most attractive feature. 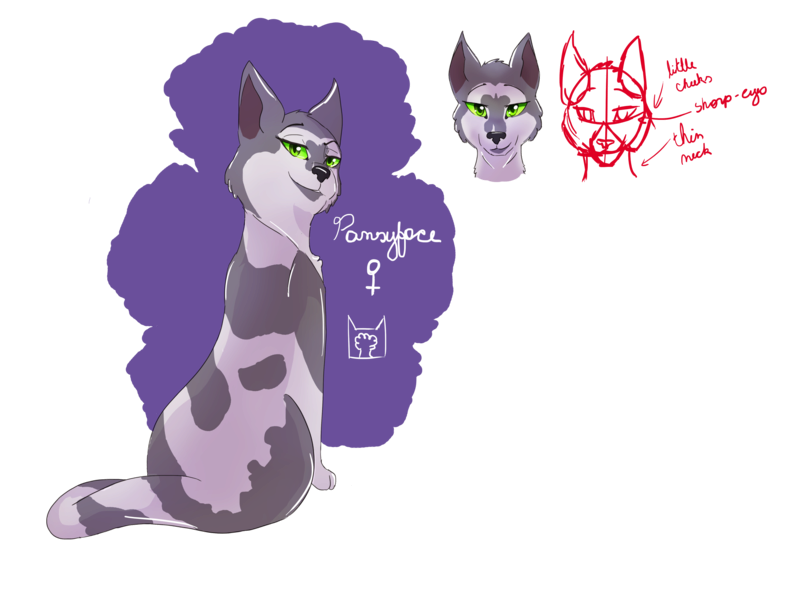 Personality: Pansyface was an adventurous soul from a very young age, always bounding off to investigate new things and dreaming of what the world was like outside of her clan's boundaries. Though rebellious against those who tried to harness her, and not afraid to let her sharp tongue free, she was a very confident and clever warrior, and after a certain doomed romantic escapade in her youth gained a very deep-rooted loyalty to her clan, which in the end she put above all. She was quite a social butterfly, her (mostly) playful sarcasm bringing a great laugh to any conversation; but on the other hand, her arrogance and vanity could easily become grating to cats who can't tolerate such things. 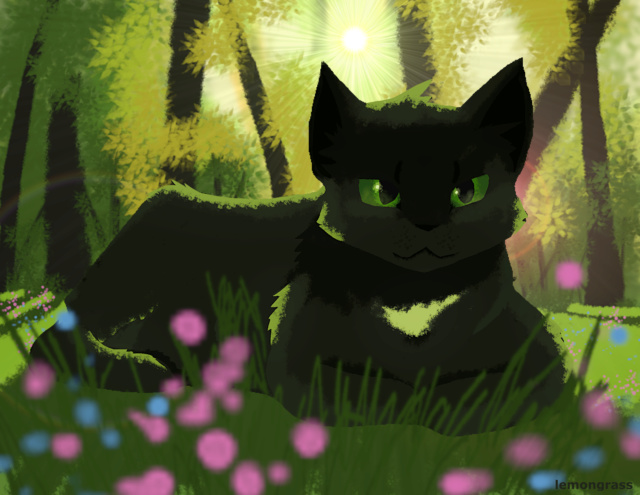 As she grew and matured though, she showed herself to be truly kind-hearted and selfless despite her many flaws, and after her untimely death, she is widely remembered as a great warrior of SkyClan. 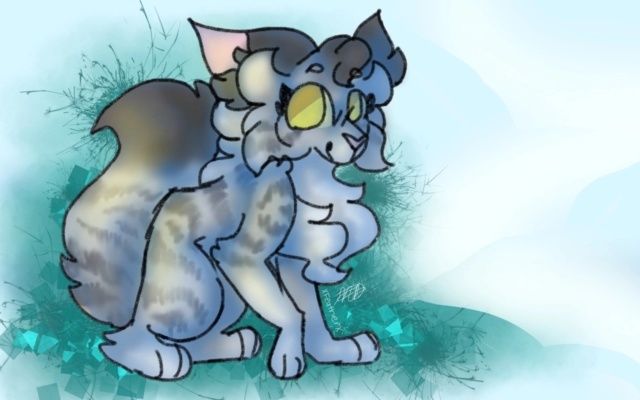 Once she joined StarClan though, watching her daughters go on without her began to take a toll on the once happy she-cat, especially after being rejected by Fernpetal and cast away by her troubled kit. 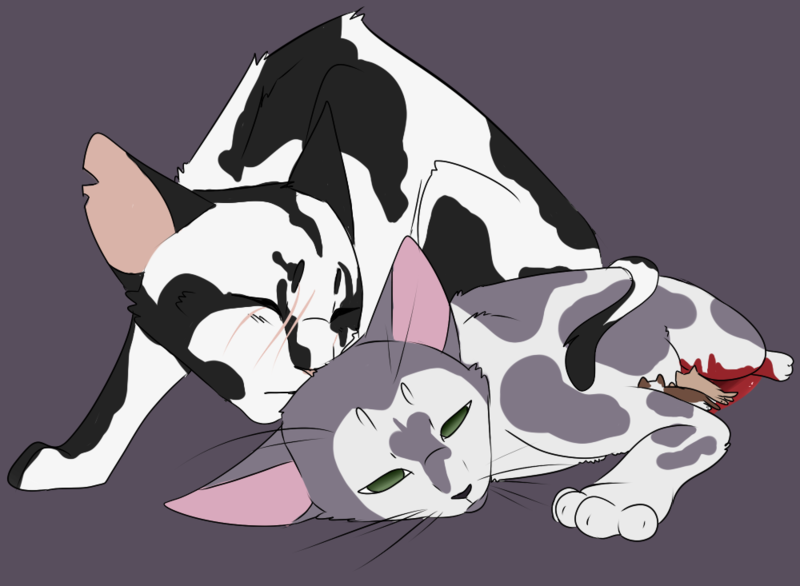 She has become motherly to all cats whom she is able to visit, but behind her caring words hides an intense sorrow and a constant worry that, in the end, even after all they'd been through, she might not be able to welcome her firstborn daughter into StarClan. Physical Description: Leopardstar is a large, muscular, long-legged pale golden tom with darker golden-brown spotted tabby markings, black-tipped ears, a long tail, and large paws. 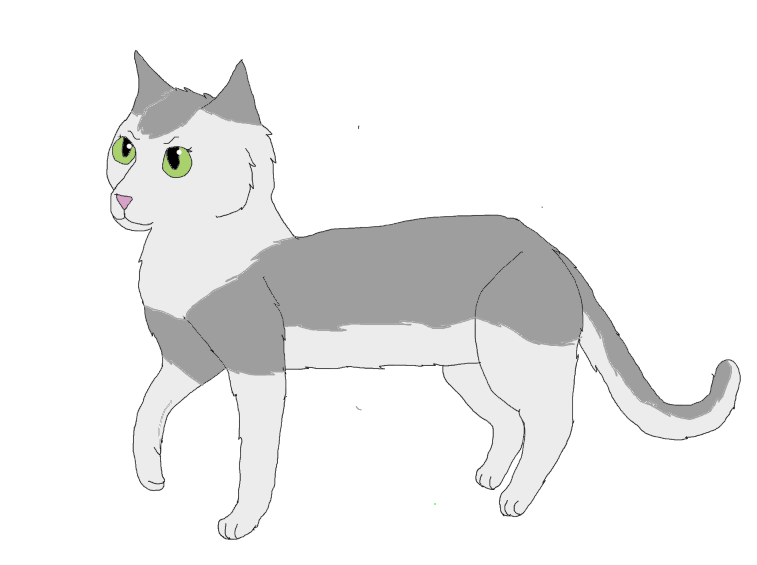 Despite his sturdy build, he is also surprisingly lithe and slender which aides in speed; thanks to his dubious rogue origins he looks as if to be a mix between the traditional body types of both ThunderClan and WindClan. He has many scars, most notably a V-shaped tear in his left ear, a deep scar across his right shoulder, and a series of crisscrossed scars on his right front leg. His eyes are a light hazel shade with an outstanding amount of pale green. 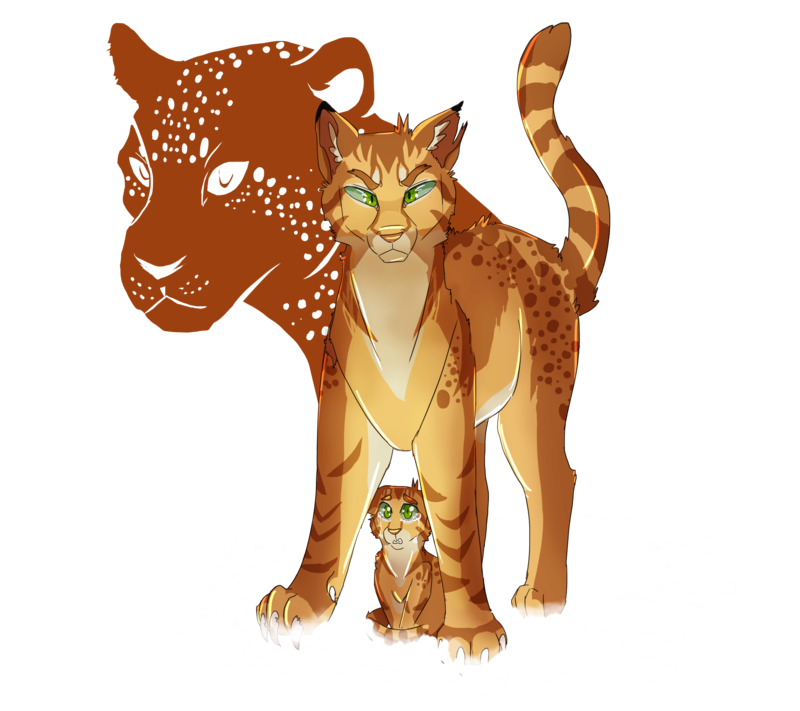 Personality: Leopardstar is deeply loyal to his clan, and upholds a strong moral code, favoring righteousness and true passion to serve one's clan above physical strength or blood purity, traits which he always tries to uphold. He is a very intelligent and hard-working leader and lives to serve his clanmates. He has a kind heart and is deeply protective of his family and clan, but around cats he doesn't know he is often stoic and overly serious. 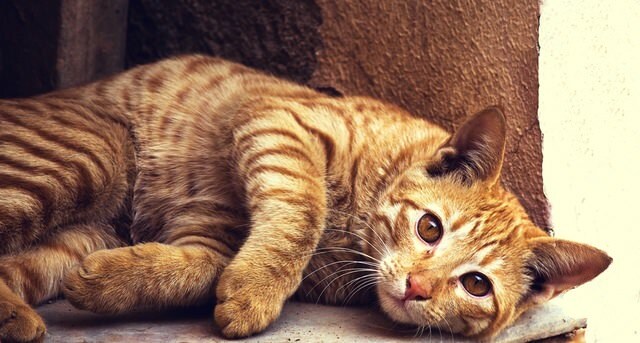 When with cats that he is comfortable around though, he can be quite playful and funny, often joking around with and teasing them in a well-meaning way. Despite his high position within the clan, he finds it hard to interact with others in a casual social setting, aside from his family. He is very socially awkward, and it can often come off as if he is very emotionally distant from the conversation. Because of this, he usually prefers to keep to himself, or only interact with the few cats who have managed to make him feel comfortable. He is haunted by his past and is plagued with anxiety and self-doubt because of parental abuse and abandonment by his biological mother at a young age. He is quite emotionally fragile, and often leans heavily on his friends and family for support; at the same time though, he often puts up mental walls against cats who wish to get to know him, for fear of the day that they will inevitably leave him, either through death or by choice. Not an easy cat to get to know, but those lucky few who have earned his trust and love he cherishes deeply and would do anything to keep them safe. He is a determined soul, willing to stop at nothing in the fight for what he believes to be truly right; at times though this can reflect into unnecessary stubbornness. 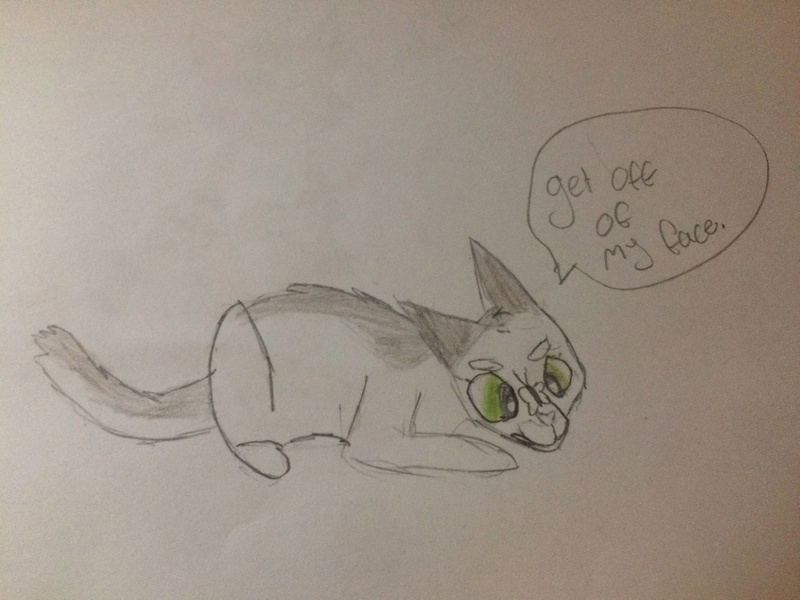 Though most of the time he is known to be a calm, level-minded cat who always thinks before he leaps, he is quite sensitive when it comes to cats bringing up his origins or insulting his family, friends or clanmates, and if one were to get on his bad side they would not be in for a fun time. Despite his issues with casual social interaction, he is surprisingly a very good storyteller, speaking in a clear, but eloquent way; he uses this skill wisely when dealing with high-ranking cats from other clans, and is a skilled diplomat. "I will always love you my kits, and even if you can't see me, I will be there, forever." 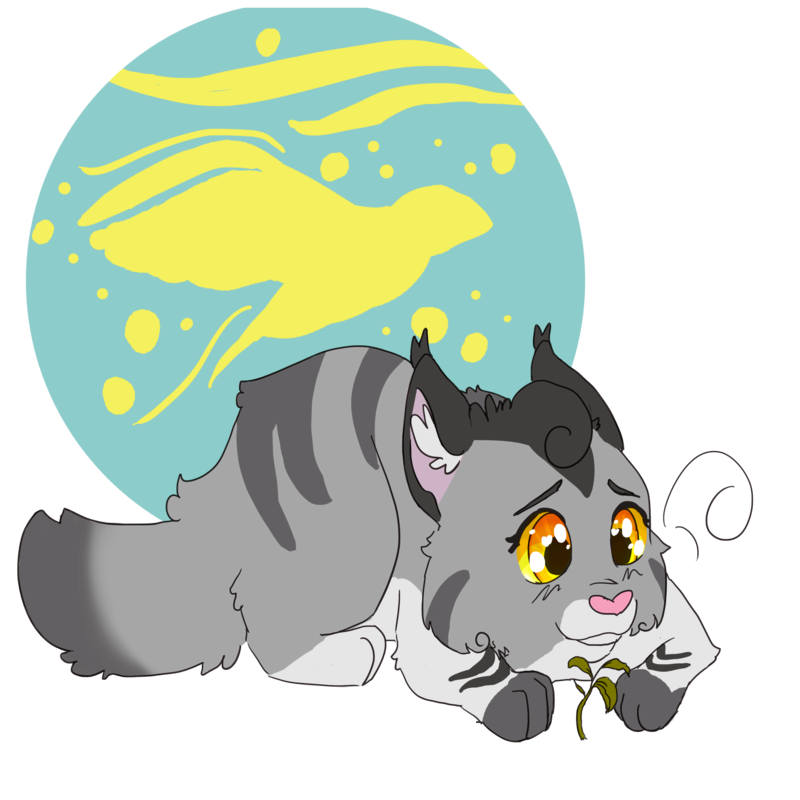 Physical Description: Finchstream was a small, short, long-furred silver and white classic tabby she-cat, with softly blurred black markings. Though she was fairly petite, her very thick, poofy fur made her look a bit bigger than she actually was; her pelt was most dense on her neck and chest, giving her a sort of 'mane' which added greatly to her cuddly, friendly appearance. Her tail was similarly very poofy and almost cloud-like, and her ears were tufted. 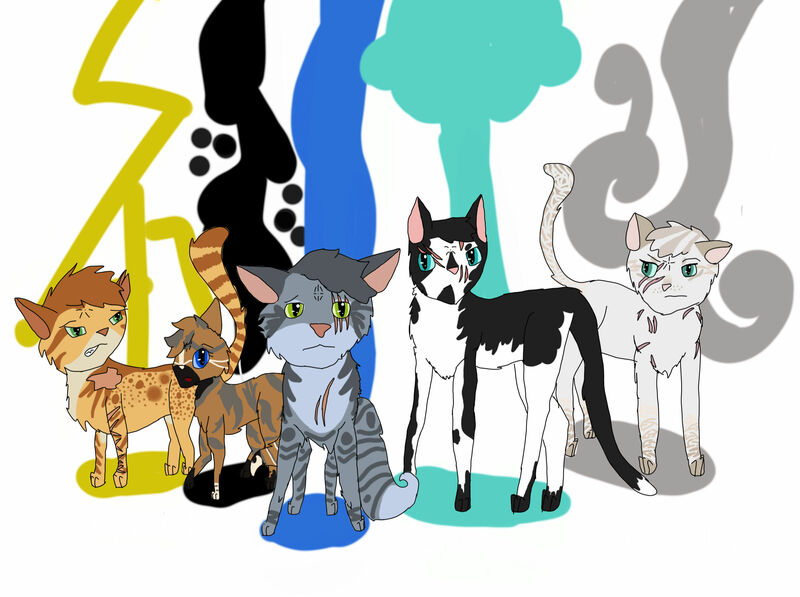 She shared the traditional traits of a RiverClan-born cat, sporting broad feet with webbed toes, and an almost water-resistant coat. 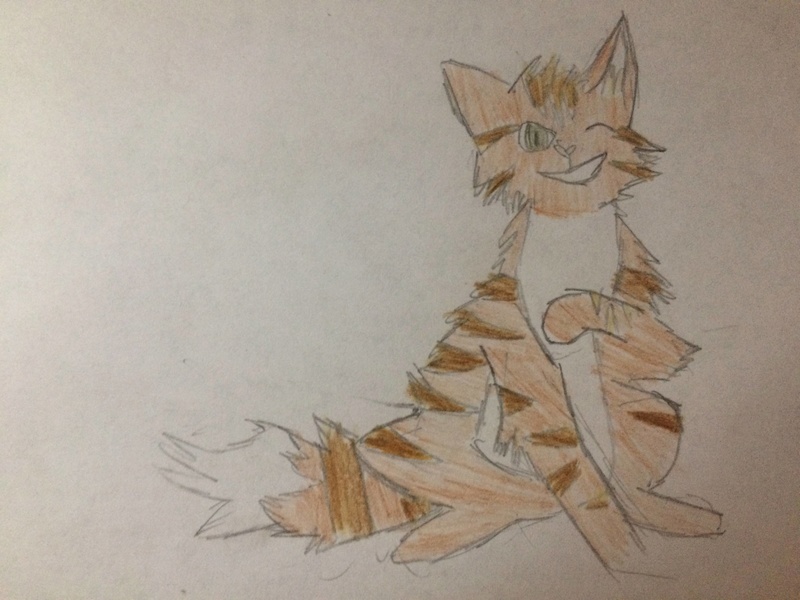 Due to the thickness of her fur though she didn't dry off as quickly as most RiverClan cats, but definitely quicker than any other long-furred cat would. Her rounded eyes were a bright shade of gold, which stood out nicely against her monochrome pelt. Personality: Finchstream is the definition of pure-hearted; she was born with an innate desire to help those in need and to encourage kindness and affection in those she loves by giving it away ten-fold. She's about as sweet a cat as you can find, though this also comes with its downfalls. She is known to be soft, fearful, and a bit submissive, and she wouldn't dispute that. Due to a traumatic experience with gore at a young age, she developed a pathological fear of blood and violence, which she managed to keep hidden from her clanmates for many moons. She did not learn to fight properly as an apprentice due to this, and thus she tried her very hardest to avoid battle, but eventually, her secret was revealed. Since then though, she has begun to grow to be a much different cat as she's faced her fears, channeling an unmovable determination and passionate loyalty to her clan in the effort to regain her stolen bravery. Despite coming so far though, she is still quite a naive cat, and though she usually thinks things through in some occasions she has been known to be very emotionally impulsive. She is very receptive to other cat's emotions - whether they want her to know them or not - and uses this skill to comfort those who are hurting, and encourage them to keep going. A Little Water Never Stopped Us! "Fly. I'll be waiting...among the stars." Physical Description: Ryeheart was a well-muscled, slender, handsome medium-furred golden-ginger mackerel tabby tom with a white patch of fur on his throat and chest, as well as white front toes. His tabby markings were a calm dark ginger; he had a few white hairs sprinkling his muzzle, long, feathery whiskers, and a fluffy tail. His eyes were a vivid icy blueish-green color with a few flecks of amber, that almost appeared white in the sunlight. 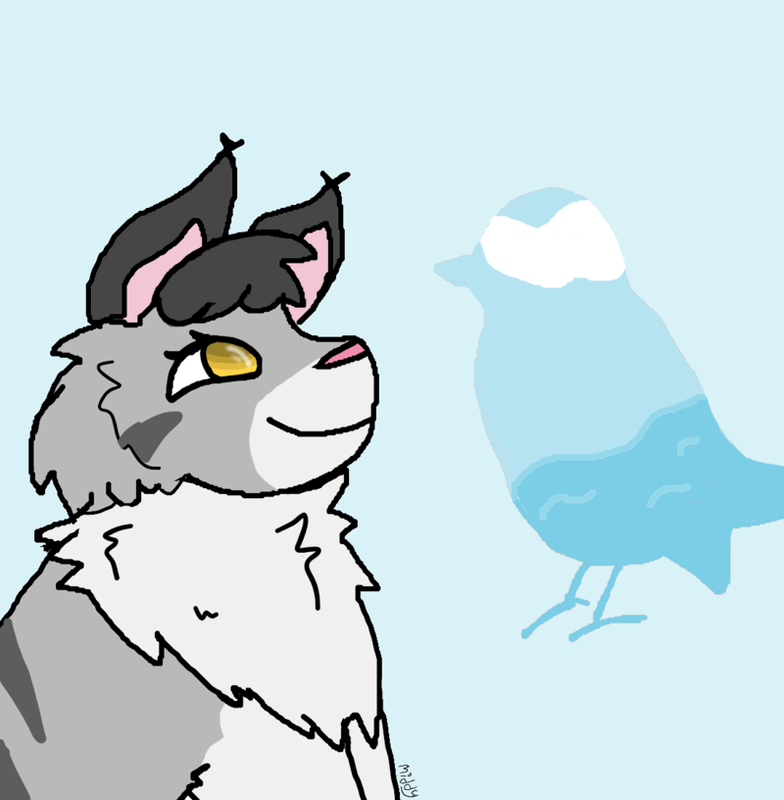 "All I ever wanted was the world"
Physical Description: Laurelsong is a short-furred, sleek white she-cat with pale silvery-gray ticking on her back, tail, ears, and head. 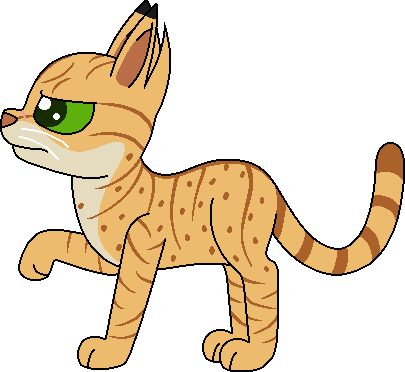 She is of average height for a WindClan cat, and has a lithe, strong body, perfectly built for running. She has a uniquely shaped head with a small muzzle and nose, and her ears are quite large and naturally pricked. Her rounded eyes are a bold shade of chartreuse. Personality: Laurelsong is an energetic, eager young cat; she craves excitement and action and quickly grows bored with the mundane and routine. She loves to explore and discover new things and places, which often puts her and her friends into dangerous situations. She is a skilled warrior, making her very confident and sure of her abilities; this shows most often through overwhelming arrogance and sometimes teasing that can border on bullying. She is very competitive and will do whatever it takes for her to 'win' in her eyes, even if that involves things that might be considered immoral. In truth though, Laurelsong is scared of not leaving a legacy; she wants to become a legendary warrior like her great-grandmother Ashstar, and the thought of just being a mediocre expendable member of the clan scares and disgusts her. 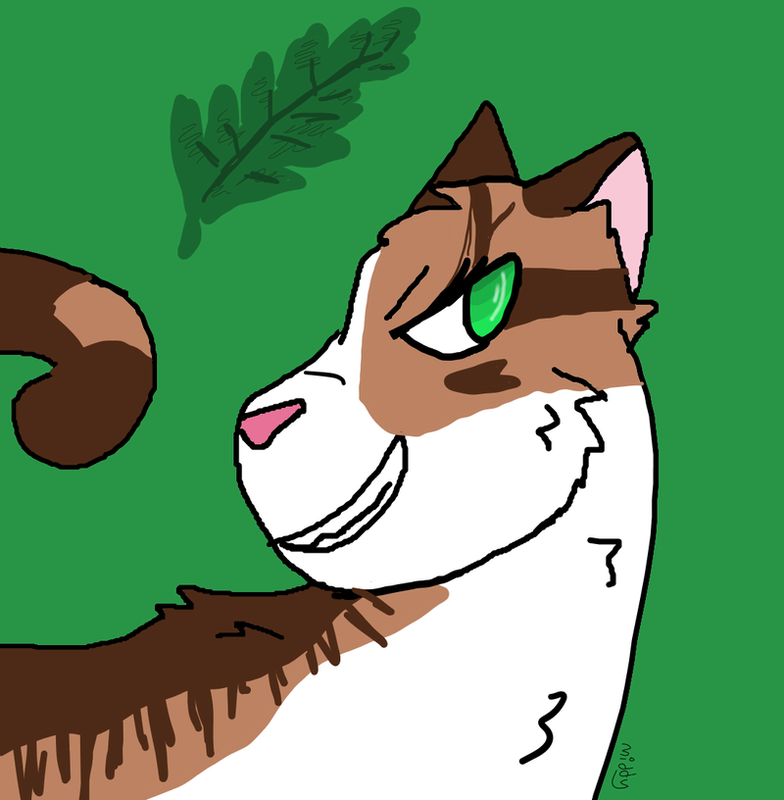 She is very ambitious and is determined to achieve her dream of becoming the leader of WindClan someday. She is intelligent, and has great skill in manipulation; with a mix of good acting skills, a poker face, and a way with convincing words she can usually twist any situation to her favor. She is far from mature, often speaking in a playful, youthful way that can make some underestimate her, but she is fully aware of her responsibilities, and deeply passionate and loyal to her clan. 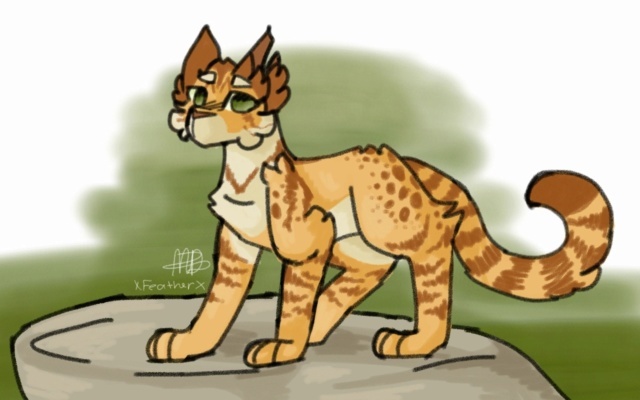 She adores WindClan with all her heart and believes it to be the best clan in the forest where only the bravest, most impressive warriors should live. She is very sarcastic and is quick to come up with snarky remarks and comebacks. 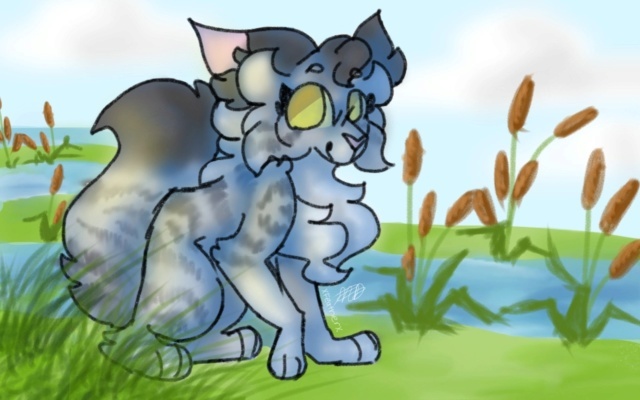 Extremely stubborn, once she has her mind set on something, or has decided what her view is on a situation, it would take all StarClan's power to change her mind. She cares deeply about her friends and family and would do anything to protect them and make them happy, but despite this, they often fall victim to her vindictive and selfish ways. She is quick to form grudges, and it is very rare for her to just give up on or move on from some sort of disagreement, no matter how petty or contrived it is. She is extremely short-tempered; she could go from calm and happy one second, but if someone messes up or upsets her, she won't hesitate to let them have it and doesn't hold back. She has a huge ego and believes herself to be above other cats, causing her to be bossy, self-centered, and act somewhat spoiled. She's a bit of a...female-dog if you know what I'm talking about. A lot of her personality is a mask for her insecurity about her position and jealousy; she is very unpredictable, a loose cannon of emotions that can go off at any moment if she is pushed too far. She has shown a violent side in the past when she's allowed herself to lose control, and she has not matured past that. "Under the waves and the earth of an age, lie a thousand old northerners graves"
Physical Description: Nightstorm is a tall, wiry jet-black tom with a small 'star' of white on his chest, which stands out brightly against his otherwise dark features. 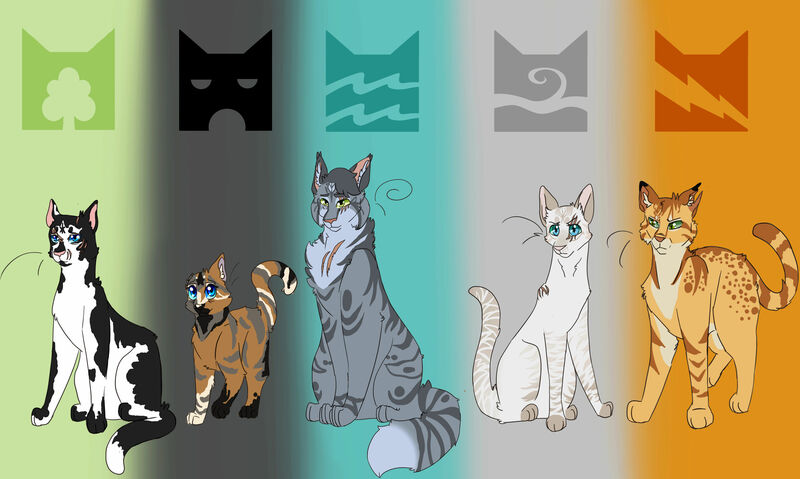 He has the build of a traditional SkyClan cat, which includes muscular hind legs and haunches, a long tail, and strong gray paw-pads, to help him climb trees and scramble over rocks with ease. He is the spitting image of his grandfather, Night of Many Stars, whom he was named after. His eyes are an intense, handsome shade of leaf green. 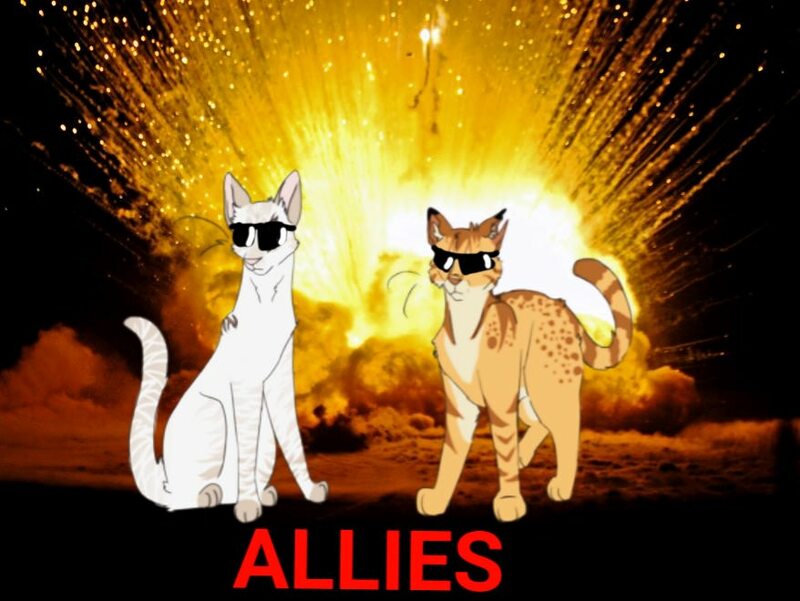 "Someday we'll all be gone, but lullabies go on and on"
Physical Description: Sandkit was a slender, well-muscled pale ginger tabby tom-kit with a pale-colored underbelly, paws and muzzle, a cute pink nose, and pale greenish-hazel eyes. 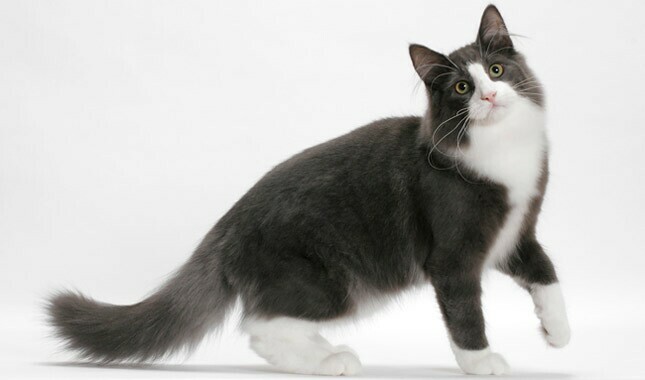 Physical Description: Fernpetal is a slender but muscular brown mackerel tabby and white bicolor she-cat; the entire bottom half of her body, including her legs and paws, is white, while the top half, her tail, and most of her head and face are a chocolate tabby coloration. 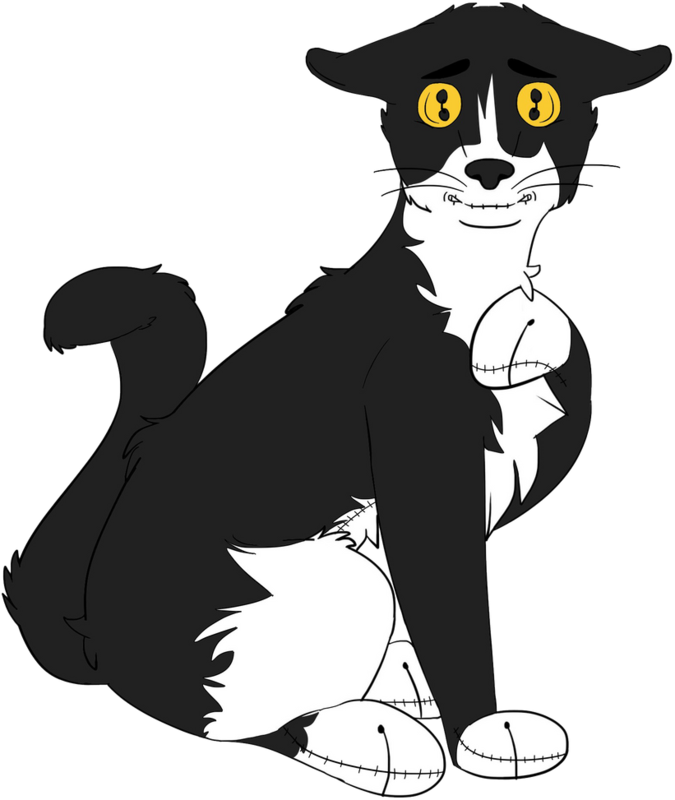 She has most of the traditional features of a SkyClan cat, such as powerful hind legs and a long tail, but her paw-pads and nose are soft-skinned and pink, making climbing a bit more difficult for her at times. She inherited her mother's stunning murky green eyes, which are flecked with brown and a little bit of yellow. 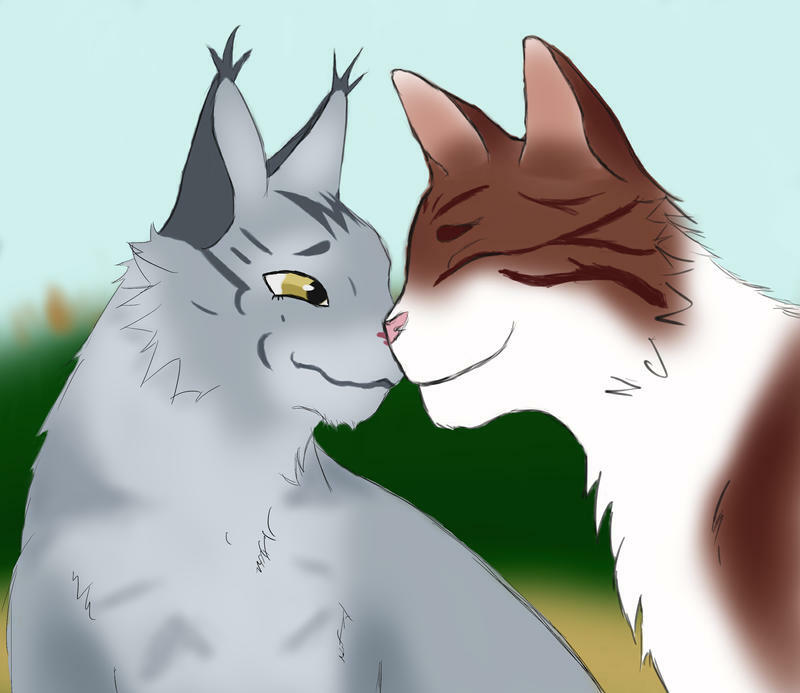 "You've earned all this and more...now, I can die with a smile on my face"
Physical Description: Aspenpaw was a semi-longhaired dark gray mackerel tabby tom with a white undercoat, hard to see beneath the dense amount of tabby stripes that covered his body. His muzzle was white, he had fluffy inner-ear fur and a long flowing tail. His fur was a bit more fluffy on his hindquarters, underbelly, and front legs, and he had long white whiskers. He had a sleek form with small paws and quite a bit of hidden muscle, making him great at stealthy ambushes on prey and enemy alike. 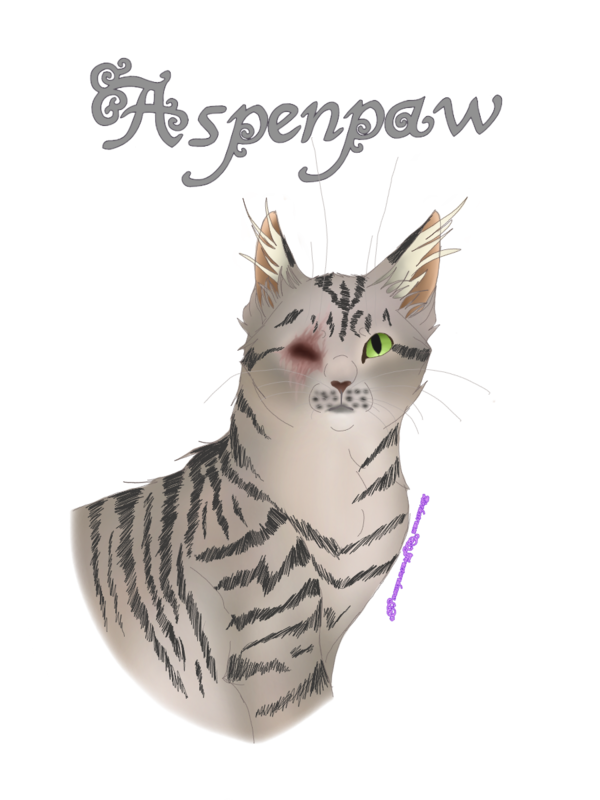 His right eye was torn out during a fight in his apprentice moons, leaving only an empty scarred socket with seven claw marks carved into his skin. His remaining eye was a vivid, piercing dark forest green, that often was quite unnerving. "What am I destined to be? It's a mystery baby, just please don't leave me alone"
Magpiekit ⇢ Magpiepaw ⇢ ??? Physical Description: Magpiepaw is a small, slender, slightly scrawny black-pelted tom with a white underside, paws, chest, and throat. The top half of his muzzle is also white, which extends into a blaze along the right-hand side of his nose and forehead. His coat is short and shiny - a RiverClan trait making it easy to repel water while swimming - but his shorter than average tail and small, delicate paws are a bit odd to see in his clan. He has a petite black nose, short white whiskers, and slightly small ears. 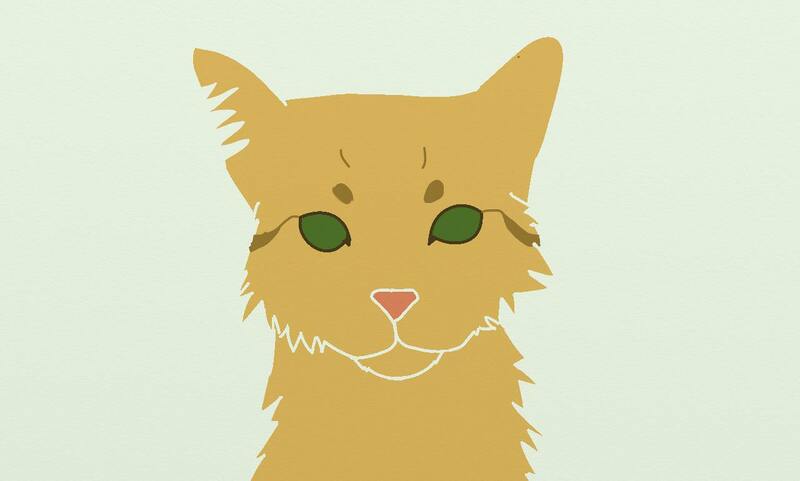 His eyes are a vivid shade of gold, which he inherited from his mother Finchstream. Personality: Magpiepaw is a very shy little tom, preferring from a young age to stay in the nursery with his mother rather than go frolic with the other kits. He is very anxious about the outside world and the clan, thus he is extremely socially awkward and very insecure. All this makes him very jumpy and easily startled, so it's no surprise that many cats would describe him as a bit of a wimp. He's not naturally skilled at pretty much anything and is very slow when it comes to learning new things. Because of this, he is very self-critical, and his poor self-image makes him very prone to being hurt by even the smallest things. He's only really comfortable around a few of his family members, especially his mother. 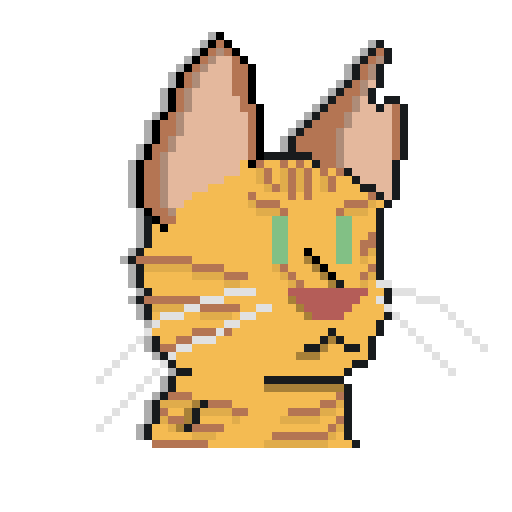 Underneath this shell though, he is a very kind-hearted cat who cares deeply about his clan, and his loyalty to the home that raised him is unquestionable. He is caring to all, and selfless when needed to protect those whom he cherishes. He is quite open-minded, wanting to see beyond clan rivalries and petty interests to what really matters in the long run, but he acknowledges that sometimes battles and wars are needed in order to survive in the world. Despite coming from weak beginnings, he is determined to learn all he can so that he can serve his clan, working hard despite the feeling that everything is pushing him back. In the right setting, he can be very talkative, longing to bond with those who have accepted him despite his weaknesses. 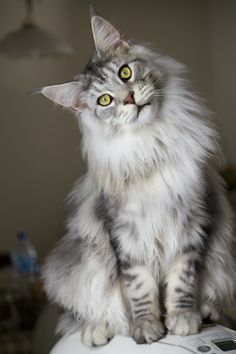 His own troubles drive him to encourage others with words he often doesn't follow himself, and his cautious nature ensures that he is a cat who always looks before he leaps. You Are 30% Hufflepuff, 28% Ravenclaw, 23% Gryffindor, and 19% Slytherin! You belong in Hufflepuff without question, but your Ravenclaw-esque appreciation for knowledge means your many friends come to you when they need advice from someone with a level head. While you enjoy any kind of learning, working as part of a team is where you truly thrive. You are an excellent collaborator, and understand that communication with others is an essential part of learning and, more importantly, growing as a person. 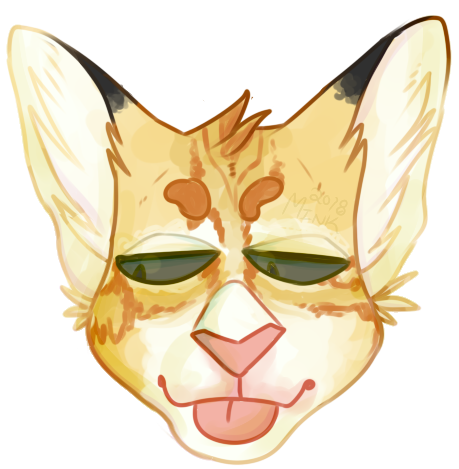 "See, I was born a restless child, and I could hear the world outside calling me"
Physical Description: Chirp is a petite, short-furred calico she-cat with softly blended ginger, black, and brown patches dappling her head, back, flanks and tail. In a few places, such as her chest, tail, and rump, her fur is a bit longer and silkier, and she sports spiky inner-ear fur. Her muzzle is pure white with a cute pink nose, and she has small, nimble paws with tough pads, perfect for traversing the rocky terrain of her home. As with all Tribe cats, she has very powerful hind legs that allow her to leap high into the air to catch birds and climb trees. Her eyes are a dark brownish-amber, a bit unremarkable compared to her vibrant pelt. Personality: Chirp is the definition of bubbly. She is always full of energy and trying to chat with every cat in sight, sometimes all at once. She is characteristically happy, almost to a fault. It is extremely rare to ever see her without a bright smile, to the point where it is sometimes inappropriate. It's easy to think that she just doesn't know how to take anything seriously, and thus most probably consider her an airheaded ditz, but she has most depth than she's given credit for. 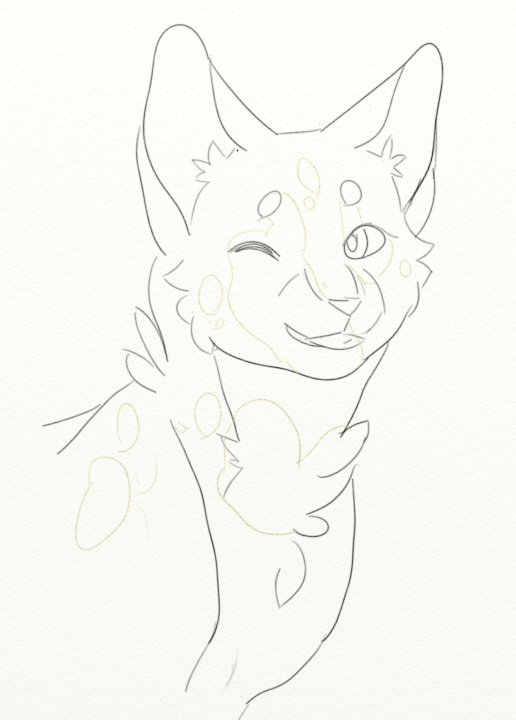 She loves her Tribe with all her heart and is deeply invested in its history and stories, especially about the cats who left moons ago to find SkyClan, since one of those voyaging cats was her very own cousin. She comes from an ancient line of prey-hunters, a legacy which she is proud to carry on, and adores what is left of her family. She's eager to learn and explore and make friends with her Tribemates...and anyone else who may come along. You Are 40% Hufflepuff, 25% Gryffindor, 19% Slytherin, and 16% Ravenclaw!